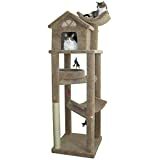 Found 18 Pet Gear No Zip Stroller Cat Cat Products. 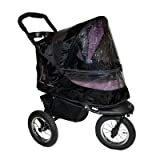 Pet Gear has really "raised the bar" with our new Happy Trails Lite No-Zip stroller. No zippers means no hassle when trying to open and close the stroller. Our new No-Zip technology means that you can easily gain access to your pet without fumbling with difficult zippers! The Happy Trails Lite No-Zip stroller also features an elevated paw rest. Your pet can easily look out of the stroller by using the front bar for support. The new panoramic view window allows your pet to remain safe inside of the stroller without missing any sights while you stroll! 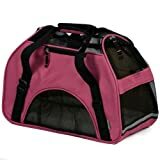 Interior dimensions: 22"L x 10"W x 19"H. Suitable for pets up to 25-pounds. 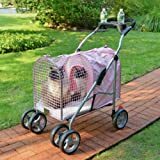 Whether you are an avid jogger or you simply want an extra smooth ride for your pet, the Pet Gear, Inc. Jogger NO-ZIP Pet stroller is the perfect fit. No zippers means no hassle when trying to open and close the stroller. Our new NO-ZIP technology means that you can easily gain access to your pet without fumbling with difficult zippers! The Jogger NO-ZIP Pet Stroller also features an elevated paw rest. Your pet can easily look out of the stroller by using the front bar for support. This stroller navigates over rough terrain with ease, whether jogging or strolling, thanks to the front locking wheel and air tires. 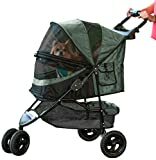 Speaking of strolling, the new panoramic view window allows your pet to remain safe inside of the stroller without missing any sights along the way! Features large storage basket, parent tray for all of your extras, interior safety tether and 12" quick-release air tires. Interior dimensions: 30"L x 13"W x 22"H. Suitable for pets up to 75 pounds. Available in three colors: Forest Green (PG8400NZFG), Midnight River (PG8400NZMR) and Rugged Red (PG8400NZRR). An air pump, that can conveniently be stowed in the large storage basket, is included. Pet Gear’s NO-ZIP Expedition Pet Stroller has many new, exciting features. Our largest stroller offers a spacious, comfortable ride for both single and multiple pets. It features two easy-locking doors. Pets can now be loaded from either the front or back of the stroller and exit without having to turn around- a huge benefit for large or injured pets. No zippers means no hassle when trying to open and close the stroller. Our new NO-ZIP technology means that you can easily gain access to your pet without fumbling with difficult zippers! We’ve also added a multi-position handle which means more comfort for you while pushing the stroller. What's more special than our Special Edition stroller? Our new Special Edition NO-ZIP stroller. No zippers means no hassle when trying to open and close the stroller. Our new NO-ZIP technology means that you can easily gain access to your pet without fumbling with difficult zippers. The Special Edition NO-ZIP stroller also features an elevated paw rest. Your pet can easily look out of the stroller by using the front bar for support. The new panoramic view window allows your pet to remain safe inside of the stroller without missing any sights while you stroll. New, lustrous material, featuring the Pet Gear monogram, ensures that your pet will be riding in style anywhere you go. Features parent tray for keys/water, one hand easy-fold mechanism, large storage basket, interior tether and top window viewing area. Interior dimensions approximately 25.5 inch L x 12 inch W x 20.5 inch H.
Pet Gear’s new NO-ZIP Double Pet Stroller is truly one of a kind. The extra-wide carriage design offers a spacious, comfortable ride for both single and multiple pets. No zippers means no hassle when trying to open and close the stroller.Interior dimensions: 27"L x 20"W x 23"H; stroller height to handle 42". Our new NO-ZIP technology means that you can easily gain access to your pet without fumbling with difficult zippers! Quick-release air tires ensure the smoothest ride possible. We’ve also included a plush bolster pad and weather cover to create and extra-comfy environment for your pet, even in bad weather. The NO-ZIP Double Pet Stroller also features an elevated paw rest. Your pet can easily look out of the stroller by using the front bar for support. The new panoramic view window allows your pet to remain safe inside of the stroller without missing any sights while you stroll!. 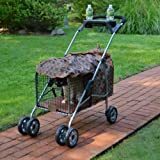 The new Pet Gear, Inc. AT3 NO-ZIP Pet stroller is the perfect option for taking your pet wherever you go; from strolling through your neighborhood to the rougher terrain found on your favorite walking or jogging trail. No zippers means no hassle when trying to open and close the stroller. Our new NO-ZIP technology means that you can easily gain access to your pet without fumbling with difficult zippers! The AT3 NO-ZIP Pet Stroller also features an elevated paw rest. Your pet can easily look out of the stroller by using the front bar for support. This stroller navigates over rough terrain with ease, whether jogging or strolling, thanks to the front locking wheel. Speaking of strolling, the new panoramic view window allows your pet to remain safe inside of the stroller without missing any sights along the way! Features large storage basket, parent tray for all of your extras, interior safety tether and 12" E.V.A. tires. Interior dimensions: 30"L x 13"W x 22"H. Suitable for pets up to 75 pounds. Available in three colors: Forest Green (PG8350NZFG), Midnight River (PG8350NZMR) and Rugged Red (PG8350NZRR). 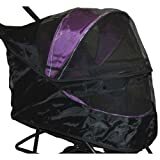 Keep your pet dry and protected from the elements with a Weather Cover for your Pet Gear Happy Trails No Zip Stroller. 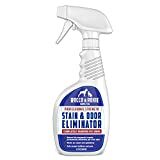 Rain and wind guard with a clear window provides visibility while offering rain and wind protection for your pet. Fits all Special Edition No Zip Strollers; PG8250NZCH, PG8250NZOR and PG8250NZSG. STROLLER SOLD SEPARATELY.